Single Story Home Under 2500 Sq.Ft.-REM980225-Carolina Coastal Designs, Inc. 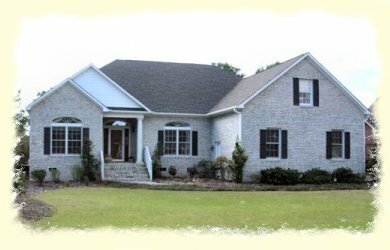 This transitionally designed 3-bedroom brick home sits alongside the fairway on the Founders Club Golf Course in St. James Plantation, North Carolina. A covered front entry welcomes homeowners and visitors alike into the foyer which adjoins the great room. This dramatically vaulted area has a gas fireplace and a two story wall of windows that opens to a spacious deck overlooking the golf course. The modern kitchen, with its brightly lit breakfast room, is set alongside the great room on the rear of the house. A formal dining room is also provided on the front of the home. The master bedroom suite sits privately to one side of the central living areas and opens directly to a scenic screened porch. Two additional bedrooms and a full bath are located on the opposite side of the home. The laundry area is set next to entrance to the side loading 2-car garage. A staircase off the main hallway leads to a second story bonus room. A powder room is conveniently provided on this level.